Unique design can be used as cabinets or enclosed locking storage. Ideal for libraries, breakrooms and conference rooms. Henna Cherry finish. Features commercial grade 1" thick shelves. Resists water, scratches and dents with a PVC protective edging. 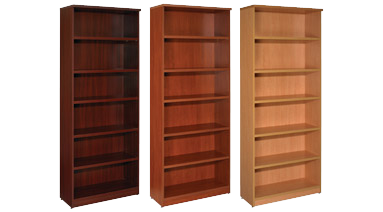 32"W x 14"D x 80-1/2"H. 6 shelves (3 adjustable). Ready to assemble.